On Sunday, July 13, 2014, I returned to the trails with a new foster dog for a show and tell along the trails. I had been on an extended break as I attended to the demands of providing hospice care and then enduring the recent losses of my two dogs who inspired me to begin this blog three years ago. 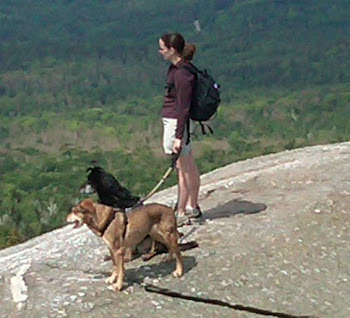 And so I decided it would be fitting to celebrate the blog's third anniversary with a hike where the Foster Dog Summit adventure began back in 2011 on the trails of Mt. Major. I also had visited Mt. Major with Bandit and Neely on a number of occasions, and I relived many happy memories of our trips as Piper and I hiked along on a humid afternoon. I lost count of how many times I heard someone say, "What a cute dog!" as I walked Piper out and back the Brook Trail en route to the summit of Mt. Major. I completely agree that Piper is extremely cute. Following our very pleasant trek in which we encountered numerous other hikers and their canine companions, I also agree that Piper is very well behaved, quiet, friendly and walks well on a leash. Since Piper had limited experience with leash walking, I opted to use the Gentle Leader harness on our way up the trail. However, she walked so nicely without any pulling, that we used a regular collar and leash on our descent. This 2-year old mixture of Labrador retriever and possibly Spaniel or Pointer would love to find an active home where she has plenty of opportunities for exercise and adventure. She was as comfortable on the trails as she was riding in the backseat of the car. Piper does like to chase the small critters, so she would prefer a home without cats. If Piper were a cat lady, I can assure you that her hike would have ended with me adopting her. Piper is currently being assisted by the rescue group Canine Guardians for Life, Inc. She is in between foster homes and is residing in a boarding kennel while she awaits a temporary or permanent family. To inquire about adopting Piper, please visit her Petfinder.com profile here. If you are interested in providing a foster home for Piper, Almost Home Rescue of Maine is taking applications for foster families here. Watch and share Piper's Sixty Second Summit below or click here for the link. A full album of photos from her hike is available here at the Foster Dog Summit Facebook page.